3D scanners can clone architecture, objects, and even your own face. But what about the natural world? 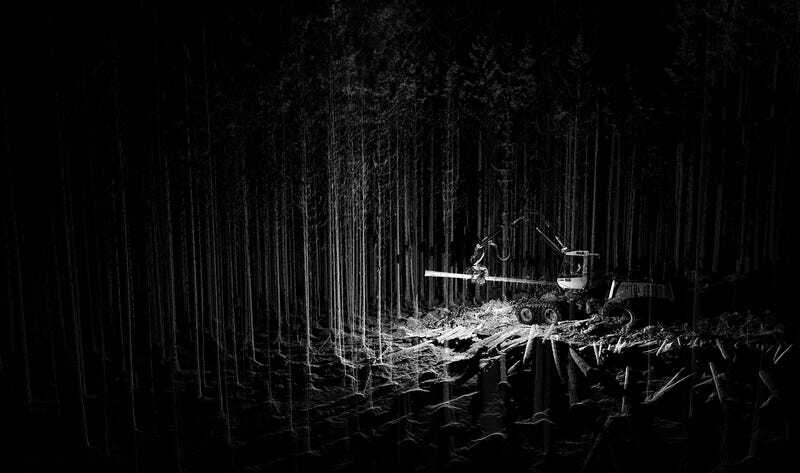 What would happen if you trained a scanner on a misty night or a dense forest? Matthew Shaw and William Trossell, a pair of British architects who specialize in generating 3D data, are finding out. Shaw and Trossell work under the name ScanLAB, and though many of their projects deal with architecture, they’re also experimenting with scanning the natural world. Whether scanning mist and humidity or traveling north to the Arctic to shoot lasers at pressure ridges and melting ice floes, their work is almost a kind of documentary holography: not a film, not a photograph, not a 3D model, but also not simply a point-cloud, their work operates almost narratively as they capture objects or places in the process of becoming something else, blurred by passing fog or pulled apart by unseen ocean currents. You could write a screenplay for scanners. An image of an ice floe captured next to a Greenpeace ship, via ScanLAB. A scan of smoke moving through a doorway, via ScanLAB. Slow Becoming Delightful, Trossell's thesis project, included scans of mist generated from humidity tanks. Via ScanLAB.